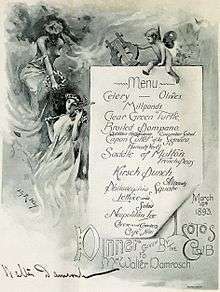 A table d'hôte menu from the dinner for Walter Damrosch at the Lotos Club, 1893. The Lotos Club has always had a literary and artistic bent, with the result that it has accumulated a noted collection of American paintings. Its "State Dinners" (1893 menu at right) are legendary fetes for scholars, artists and sculptors, collectors and connoisseurs, writers and journalists, and politicians and diplomats. Elaborate souvenir menus are produced for these dinners. The Lotos Club's first home was at Two Irving Place, off of 14th Street near the Academy of Music. Journalist DeWitt Van Buren was the Lotos Club's first president; he was succeeded by A. Oakey Hall. Other early Club officers included Vice President F.A. Schwab, Secretary George Hows, and Treasurer Albert Weber. New York Tribune editor Whitelaw Reid was elected Club president in 1877,at which time the Lotos Club moved to 149 Fifth Avenue at 21st Street. In 1893, the Club moved to 556-558 Fifth Avenue at 46th Street, purchasing their first clubhouse. It was at the Lotos Club in 1906 that George Harvey, editor of Harper's Weekly, sent up his first trial balloon by proposing Woodrow Wilson for the office of President of the United States. In 1909, with financial backing from Andrew Carnegie, the clubhouse was moved to 110 West 57th Street, in a building designed by architect Donn Barber. Frank R. Lawrence was the Club's longest serving president, from March 1889 until his death on October 26, 1918. Lawrence was succeeded as president by Chester S. Lord, who served for five years. In 1923, Columbia University president Nicholas Murray Butler was elected president of the Club. The Club has a long history of showing the work of its artist members and has also held exhibitions of work from the collections of its members including one in 1910 that featured works by Degas, Monet, Renoir, Cassatt and Hassam. In 1977, the Club amended its constitution to admit women. The objectives of this institution shall be to promote and develop literature, art, sculpture, music, architecture, journalism, drama, science, education and the learned professions, and to that end to encourage authors, artists, sculptors, architects, journalists, educators, scientists and members of the musical, dramatic, and learned professions in their work, and for these purposes to provide a place of assembly for them and other persons interested in and sympathetic to them, and their objectives, effort and work. The Lotos Club issues a Medal of Merit; previous recipients include general David Petraeus, scientist James D. Watson, flautist Jean-Pierre Rampal, and puppeteer Bil Baird. The Club also awards a Foundation Prize and an Award of Distinction. 1 2 "The Lotos Club," official website. Accessed May 11, 2011. ↑ "The Lotos Club: History and Objectives," Lotos Club official website. Accessed May 10, 2011. ↑ A.S. Link, "Woodrow Wilson: The American as Southerner", The Journal of Southern History, 1970. 1 2 Price, Charles W. (Lotos Club Vice President). Letter to the editor, New York Times (June 29, 1927). 1 2 3 Where Fancy Took Flight: Rusty Traces of Sumptuous Architecture on West 57th Street. The New York Times (2014, July 17): retrieved July 20, 2014. Wikimedia Commons has media related to Lotos Club. Documenting the Gilded Age: New York City Exhibitions at the Turn of the 20th Century A New York Art Resources Consortium project. Exhibition catalogs from the Lotos Club.